Introducing the My sommelier wine decanter by HUMBEE Chef. A must-have tool for any wine enthusiast, whether you are a true connoisseur or just really love wine; this is the Product for you. The My sommelier wine decanter uses a special magnetized device to aerate the wine, helping to delicately open up all the flavors and aromas. 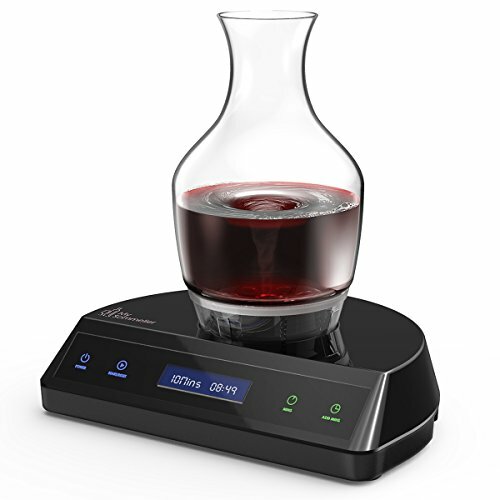 This action delivers the desired effect of decanting faster than traditional methods. A great addition to any dinner party, the My sommelier wine decanter has LED lights built in to display the decanting process clearly. Try the My sommelier wine decanter and we guarantee you will love it!. A must-have tool for the wine enthusiasts whether you are a True connoisseur or just really love wine. This is the product for you! Love My Sommelier I love this item. I bought an inexpensive bottle of Robert Mondavi Private Reserve Private Selection Merlot to give it a trial run. My wife and I did a beforeafter test and were extremely pleased with the improvement in the taste and aroma.The overall look of the unit is classy and sleek. Fits well on the bar. Cleaning the unit is extremely easy. Definitely will see some use. A Wine Lover’s Must Very cool decanter perfect for any wine enthusiast! My girlfriend and I are very happy with the purchase. You can clearly tell the the difference in taste and texture when comparing the before and after. Subtle notes of flavor are released causing an entirely new experience. We are hooked and highly recommend this product!